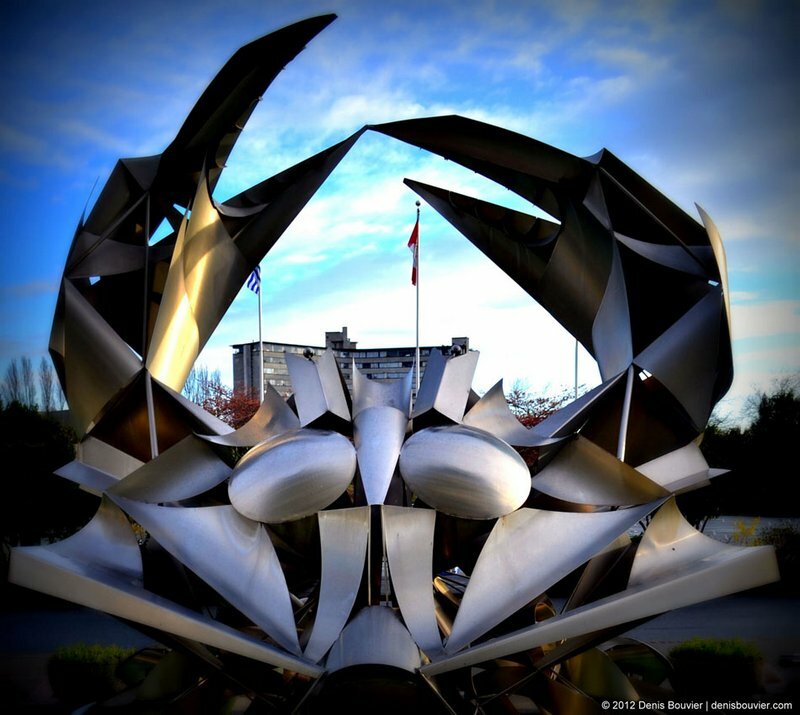 The stainless steel fountain sculpture of a crab by George Norris is a frequently photographed Vancouver icon. Located just outside the entrance to the Museum of Vancouver and the H. R. MacMillan Space Centre, the fountain and buildings were constructed to celebrate Canada’s 1967 Centennial. The crab in First Nations legend guards the entrance to the harbour. It was also the zodiac sign for Canada’s birthday in July. Oddly enough, the Crab Nebula was formed from a supernova which historical Chinese records show as first being visible on July 4, 1054. Both First Nations and the zodiac attribute qualities of protection to the crab. Notice the building we see just under the crab’s pincers. It’s Parkview towers at 1450 Chestnut St., built in 1960 by Peter Kaffka. This 14-storey Y-shaped tower came into being as an extension of the growth of towers in the West End when height restrictions there were lifted in 1956. An anomaly in a neighbourhood of family homes and low-rise buildings, local residents were outraged at the time. Its bulky exterior and olive green colour only added insult to injury. But 52 years later, it’s still the only residential tower in the area of Vanier Park which besides the buildings mentioned above contains the Observatory, City Archives, Vancouver School of Music, and the Maritime Museum, all in a beautifully landscaped setting. Maybe we can thank the protective nature of the crab for preserving the Vanier Park area from no further mega residential development after the fountain was built. Perhaps it even influenced the change in colour of Parkview Towers which is currently taking place. It might not be a bad idea if we had a few more crabs around select areas of the city!